Blog :: MuseumMasters.gr collection at the National Geographic Museum! MuseumMasters.gr follows the great exhibition “THE GREEKS”. From Chicago to Washington DC. MuseumMasters.gr collection at the National Geographic Museum 26/5 - 9/10/2016. 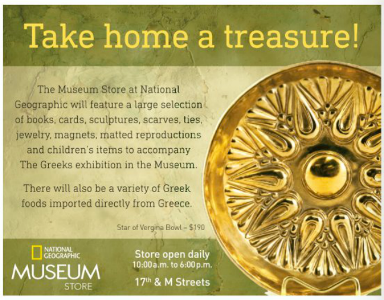 Two of the largest U.S. museum that hosted the great Greek traveling exhibition titled «The Greeks: Agamemnon to Alexander the Great» Chose selective handmade items from our art collection to enrich their museum shops. The exhibition was organized by the Greek Ministry of Culture and the Consortium of North American Museums with official representative the Canadian Museum of History in Ottawa. It is the most representative "panorama" of Greek civilization that has ever traveled outside Greek borders and include 543 exhibits-masterpieces of ancient Greek sculpture, painting and jewelry art, from all the archaeological museums of Greece. MuseumMasters.gr is the e-shop of PHILIPPAKIS APT, an artistic laboratory that counts already 53 years of life and handmade art creations in Athens, Greece. The museum chose one of the products of our collection, bowl depicting the Star of Vergina to advertise this exhibition.